As every good bumper knows, it's only a matter of time before you run into Space Lawyers who tell you that you're violating the EULA. Each space lawyer is the same. They ignore the months of denied miner petitions, in which bumping has been upheld as a legitimate activity. The space lawyer is only interested in his own interpretation of the EULA, and is absolutely convinced--for no apparent reason--that he's right. I encountered space lawyer Sol epoch in Elonaya one day as I was lending a hand to some people in the ice field. I could ignore the space lawyers, but I would prefer to educate them. Helping individuals to understand and correct their self-defeating thought processes is more effective than bump therapy alone. 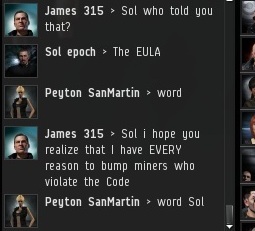 Sol went on and on, speaking as if he were the ultimate authority on the EULA. He had such confidence in himself; it's a shame he didn't direct his energy toward a more productive outlet. On occasion, people like chappa1 will step up and tell the space lawyers they're wrong. Even people who don't like the New Order will sometimes defend our right to enforce the Code. 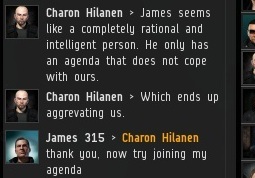 As I was in the midst of my conversation with Sol, Charon Hilanen jumped into the fray. It was just as I feared. Another one! For the space lawyer, my permaban is always just around the corner. 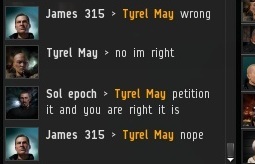 Just when I thought I had put the matter to rest, ice miner Tyrel May objected to his bumps by citing bad spacelaw! Like the others, Tyrel was adamant. Am I missing something? Have people been attending a seminar or reading a best-seller on how to be wrong about the EULA? 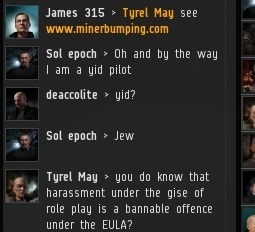 Compounding the problem, Tyrel's misconceptions about the EULA led him to believe that if he paid me for a mining permit, he would be implicated in the EULA breach. Finally, Charon's condition started to show faint signs of improvement. But he was still committed to the carebear cause. For now, at least. The day's events convinced me that even after three months of bumping miners, we still have a long way to go when it comes to educating the public about their bumping rights. It's our civic duty to get the word out! Harassment under the guise of roleplay isn't griefing. It's emergent gameplay. Learn the difference already. 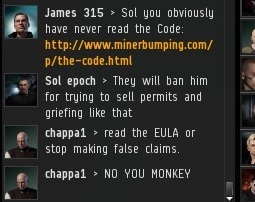 I like how the Miners who're against the New Order actually think the EULA still matters. It's an almost decade-old document that hasn't been updated since Elvis was born. 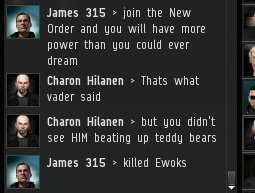 If the Miners keep petitioning the Lord, CCP will eventually have to actually update the EULA to allow Hulkageddon and the New Order and such. A much more appropriate EULA would be one or two lines saying "This isn't WoW. You're on your own. If people want to ruin your day, they can and will do that. If they want to extort you and force you to pay an arbitrary amount of ISK or in-game commodities, they can and will do that. Have fun playing!" Have YOU been bumped and it wasn’t your fault!!! Then call me!! I will fight on your behalf and get you the compensation you deserve! For a small fee of just ISK 999999.99 I can guarantee you will not be bumped for the next 365 DAYS! Is that including or excluding some unknown arbitrary taxes? Our understanding of their legal counsel company is a good 1. They're a number of moral and difficult working workers as well as lawyers and possess numerous attorneys that separately described as a great car crash attorney.